Mountaintop Retreat’s camp facilities are available for use year-round! The fee is only $10.00 per day per person. 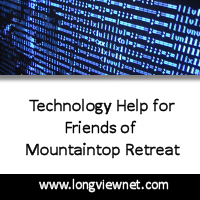 Example: guests arrive at camp at 3:00 p.m. Friday and depart at 12:00 noon Sunday – the donation amount to Mountaintop Retreat would be three times the day price = $30.00. Option 1: Mountaintop retreat can provide cooks for your activity. The cost varies depending on the type of food required and duration of your event. Option 2: You provide your own cooks and use our facilities. Please contact the camp office for available dates. Upon confirmation of those dates, a $250.00 deposit, along with a signed contract, is required to hold the dates you are requesting. If you have insurance coverage for your event please send a copy that names Mountaintop Retreat as being covered for the dates of your event. If you do not have insurance please click on Waiver (below) and print enough copies for each person attending your event.